Do you love Scentsy? Do you love unicorns? 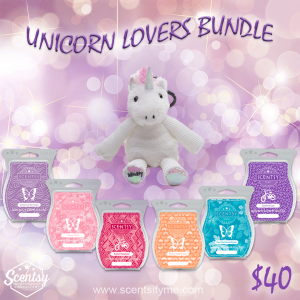 Then you are going to love our Scentsy Unicorn Lovers Bundle! This magical, colorful bundle includes a Stella the Unicorn Buddy Clip and 6 Scentsy Bars: Cotton Candy Cookie, Flower Child, Rockin’ Ruby Razz, Melon & Apple Granita, Give Me Passionflower and Gleeful Grape. This bundle costs $40, plus shipping and tax. If you don’t want the whole bundle you can purchase the just the Unicorn Buddy Clip for $15 or just the bars for $25. This bundle is NOT available on the website, you have to contact me to order. Shoot me a message at lori@scentsifyme.com and I will get you set up with this fun bundle!